Enhanced levels of community outreach. Add a new medical tower at Chandler Regional Medical Center, enabling expansion of our core areas of care including neurosurgery, thoracic disease and surgery, general surgery, oncology, cardiology, and trauma care. To accommodate this growth, we will also be building a parking garage at Chandler Regional Medical Center and adding additional medical office space at both hospitals. 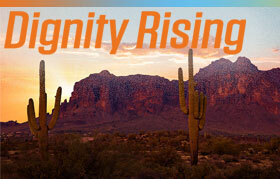 Dignity Rising will seek philanthropic investment to enhance our level of care through hiring and training the best care providers available, acquiring new medical technology which will provide access to new treatments, and enhancing our patient experience by investing in the healing environment of our facilities. Without philanthropic investment from our community, these would not be possible. Through Dignity Rising, we will ensure our East Valley neighbors have access to the best health care, technology, and care providers available in their time of need. We are proud to serve the East Valley community and look forward to providing care for all who visit our medical centers for many generations to come. Please email our Foundation President Aaron Peace directly for information. Inspired donors also drive amazing projects that are full of humankindness and benefit families in our community. Note: All contributions are tax deductible as allowable by law. We make every effort to provide an acknowledgement within 48 hours and a receipt letter within the week. The employee HERO fund to support other employees is the only project that is deemed not tax-deductible by the IRS.